1975-76 Topps Hockey featured more cards in its hockey set than in any other year until the 1990s. At 330 cards, it was chock full of players that wouldn't have made a Topps set in many earlier years. It was also loaded with specialty cards. 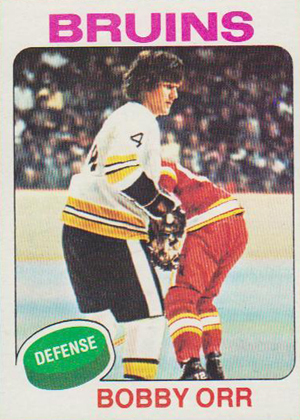 The 1975-76 Topps Hockey design was relatively simple. A player picture took up much of the space on the card. The team name appeared at the top of the card in block letters. The player's name appeared at the bottom of the card. A circular puck design contains his position. The card is surrounded by a white border, which has everything outside of the photo. The backs are more complex and feature better illustrations than what appeared on earlier sets. A skate in the upper left hand corner contains a card number, with an image of a hockey player below it. A strip extending out from the skate has the player's name, team and position. Below that are a bulleted list and the player's year-by-year stats. On the right side is an area of vital stats and then a box. For some players, a cartoon about the player appears, but some players have an illustration of a referee's call instead. The first seven cards in 1975-76 Topps Hockey recap the previous year's postseason series. All-Star players have a different design than standard players, with banners taking up the areas above and below the player's photo. Cards 81 through 98 have the teams arranged in alphabetical order by city name, with a team checklist on the back of each one. Cards 208 through 218 feature the league's leaders from the previous season. The final 18 cards feature each team's leaders in different categories from the past season. There are also three checklist cards scattered through the set. Notable rookies in 1975-76 Topps Hockey include Pierre Larouche, Clark Gillies, Ron Greschner, Peter McNab and Mario Tremblay. 1975 76 TOPPS NHL HOCKEY CARD #305 PIERRE LAROUCHE ROOKIE MINT KSA 9 SHARP! !